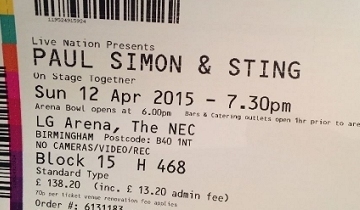 Hearing Paul Simon and Sting perform a host of classic Simon and Garfunkel hits is probably as close as most people are ever going to get to a reunion gig by the legendary duo. Mrs Robinson done in a slow country blues style was probably the pick of the bunch but The Boxer, along with Cecilia and Bridge Over Troubled Water - which were both performed during an extended encore - delighted a devoted audience at the Genting Arena. Sting, sporting a hipster-style beard, also did a version of America and just before launching into it said he was sure he wasn’t the only one there who could map their entire life out to a soundtrack of Paul Simon songs. Meanwhile Simon performed many of the songs that have rightly led to him being billed as one of the finest songwriters of the last 50 years - Me and Julio Down by the Schoolyard, 50 Ways To Leave Your Lover and The Sound of Silence among them. They might seem unlikely bedfellows but both were the driving creative forces in the acts which saw them first hit the big time - The Police and Simon and Garfunkel - before branching out on their own. The concert was a kind of relay affair with Sting and Simon sometimes performing together and then on their own, with a large and rapidly rotating backing band that seemed to be populated by some of the most talented musicians on the planet. Simon’s drummer was as capable plucking the strings of a guitar as thumping the skins on a drum kit and his version of Chet Atkins’ Wheels was spot on. One of the guitarists demonstrated even greater versatility, switching between guitar and saxophone and penny whistle and cello. Some of Simon’s highlights of the night came in the shape of the African-infused songs from Graceland that saw him achieve global fame all over again in the mid eighties. Graceland, Diamonds on the Soles of Her Shoes and You Can Call Me Al got the crowd on their feet, singing along and dancing for all they were worth. Another Graceland hit, the zydeco-infused That Was Your Mother, also stood out. The Sting songs that really got the crowd going were memorable and timeless hits The Police enjoyed - So Lonely, Walking on the Moon, Message in a Bottle, Every Breath You Take and Roxanne, which mutated into Bill Withers’ Ain’t No Sunshine. That said he’s also enjoyed considerable solo success and songs like Fields of Gold and An Englishman in New York were enthusiastically received too. The show was a lengthy one, lasting more than three hours and featuring 37 songs, but the continually revolving headliner aspect added pace and variety so proceedings never became stale and concert-goers certainly couldn’t have said they didn’t get value for money. After my bitter disappointed of the cancelled Krakow show, my eagerness for this show on home terrotory had no bounds. I am self styled massive Sting fan/ worshipper since the 70s, and seeing him perfom in the UK for the first time in 3 years was always going to a momentous occasion. And, of course, I wasn't going to be disappointed. Two tracks each from the first 3 Police albums were full of usual energy, but stand out were the versions of So Lonely and Walking On The Moon, 'borrowing' some brass from Paul Simons gang made those tracks unnforgettable. Stings voice was as strong as ever and his band, majestic! Having never seen Paul Simon, or indeed own any of his music, it was an absolute joy to behold. His emsemble of 10, we all so incredibly talented, the Paul Simon sections were stunning! Sting, Paul Simon and their cast of 15 looked like they had been playing together all their lives. The show was an absolute triumph, congratulations to Sting and Paul. PS Vinnie, as ever, is the daddy!